In this tutorial, you'll build and run a geoprocessing model. A model is a visual representation of a workflow in which several geoprocessing tools are run in sequence. The output from one tool is often the input to another tool. Your model will automate the analysis workflow from the Use geoprocessing tools quick-start tutorial. This tutorial assumes that you are familiar with that workflow. In New Zealand, pastureland for grazing livestock is threatened by various invasive grass species. These grasses are primarily spread through natural means, such as wind-blown seeds, but also through human contact. In the Use geoprocessing tools tutorial, you analyzed the proximity of one invasive grass species (Nassella tussock) to one potential source of human contact (commercial campgrounds). 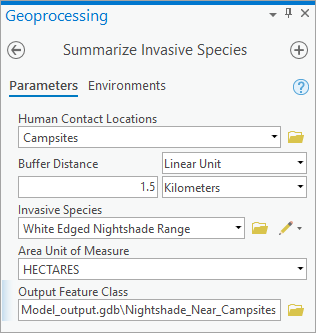 In this tutorial, you'll build a geoprocessing model that allows you to apply the same analysis to other invasive grass species and other points of human contact. At the top of the dialog box, in the Search box, type Make a geoprocessing model tutorial and press Enter. In the list of search results, click Make a geoprocessing model to select the project package. The project opens to a view of the Marlborough region of New Zealand. Commercial campgrounds are displayed along with the known range of Nassella tussock. The map contains several layers representing locations where people may come into contact with invasive grasses: commercial campgrounds, campsites, trails, roads, and populated places. The map also contains layers representing four invasive grass species: Nassella tussock, White-edged nightshade, Kangaroo grass, and Chilean needle grass. The invasive species layers represent boundaries within which a given plant has been found. They do not represent the density of the plant at a given location. A marked area may be heavily infested or may have only scattered plants. In the Contents pane, turn the different invasive species layers on and off. On the Map tab, click Bookmarks . Use the bookmarks to get a closer look at the range of each invasive grass species. Turn the layers representing potential contact locations on and off in conjunction with the invasive species layers. 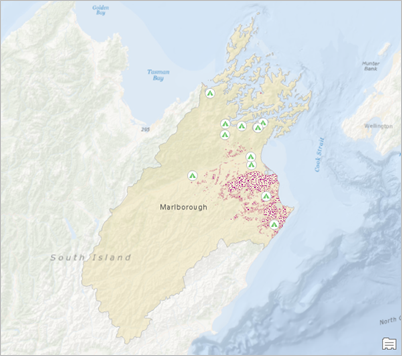 When you finish exploring the map, on the Map tab, click Bookmarks and click Marlborough Region. To turn all layers on or off at once, hold the Ctrl key and select or clear any layer's check box. You'll create a model and add a process to it. A process is a geoprocessing tool connected to its input and output data. A model with one process is the simplest model that can be run. On the ribbon, click the Analysis tab. In the Geoprocessing group, click ModelBuilder . An empty model view opens in the project. The Map tab of the ribbon is replaced by the ModelBuilder tab, and the contextual Diagram tab appears as well. From the Contents pane, drag and drop the Commercial Campgrounds layer into the model view. A blue oval element with selection handles is added to the model. This shade of blue represents input data. In the model view, right-click the Commercial Campgrounds element and click Open. The dialog box allows you to change the input value to another map layer from the drop-down menu. You can also browse to another dataset on saved locally or on the portal. For this reason, the element is called an input data variable. Click OK on the Commercial Campgrounds dialog box. On the ribbon, on the ModelBuilder tab, in the Insert group, click Tools . In the Geoprocessing pane, on the Favorites tab, drag the Buffer tool into the model view next to Commercial Campgrounds. If you don't see the Buffer tool on the Favorites tab, type buffer in the search box at the top of the Geoprocessing pane. The gray color of the tool means that it is not yet ready to run. It needs to be connected to input data and its tool parameters need to be set. When you add a new element to a model, it is selected by default. Selected elements can be dragged to new positions. To deselect an element, click some empty space in the view. To select an element, click it or draw a box around it. 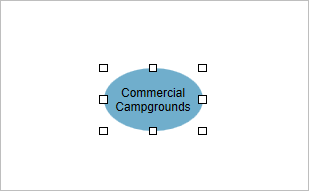 Hover over the Commercial Campgrounds input data variable. Click and drag to draw a connector line to the Buffer tool element. Release the mouse button and click Input Features on the pop-up menu. The Commercial Campgrounds layer is specified as the input data to the Buffer tool. The process is not yet ready to run because a buffer distance needs to be set. Right-click the Buffer tool element and click Open. On the Buffer dialog box, for Distance [value or field], type 5. Change the units to Kilometers. The Input Features layer is called Commercial Campgrounds:1 because names aren't duplicated in models. The input data variable itself already uses the name Commercial Campgrounds; therefore, a unique number has been appended to the input layer name in the tool. The input layer is the same Commercial Campgrounds layer that is in the map. All the elements are colored, which means that the process is ready to run. Right-click the green output data variable, CommercialCampgrounds_Buffer, and click Add To Display. This ensures that the output data will be added to the Contents pane as a map layer. The Add To Display setting is recognized only when the model is run from the model view. When the model is run as a geoprocessing tool, output data is added to the map only if it is set as a model parameter. You'll run the model as a geoprocessing tool later in this tutorial. This model will draw 5-kilometer buffers around commercial campgrounds. That's not your ultimate goal, but you'll run the model now to confirm that it works as expected. When the model runs, the Buffer tool element will turn red as it processes the input data. On the ribbon, on the ModelBuilder tab, in the Run group, click Run . When the model finishes running, a message informs you that the model ran successfully. Close the Model message box. Make the Marlborough map view active. Five-kilometer buffers are drawn around the commercial campgrounds. (Your buffer color may be different.) This was just a test run of the model, so you'll remove the buffer layer and its source data. In the Contents pane, right-click the CommercialCampgrounds_Buffer layer and click Remove . In the Catalog pane, browse to Databases > Make_a_geoprocessing_model.gdb. The output data, CommercialCampgrounds_Buffer, has been written to the project geodatabase. In many cases, you want to send model output data to its own geodatabase to keep it separate from other datasets. You'll change the location of the model output data later in the tutorial. In the Make_a_geoprocessing_model geodatabase, right-click CommercialCampgrounds_Buffer and click Delete . On the Delete prompt, click Yes. Make the model view active. The tool and its output data variable now have drop shadows. This means that the process has already been run. To prepare the model to run again, you validate it. On the ModelBuilder tab, in the Run group, click Validate . The drop shadows are removed and the model is ready to run. Before continuing, you'll name the model and save it. On the ModelBuilder tab, in the Model group, click Properties . 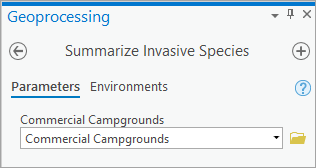 On the Tool Properties dialog box, on the General tab, change the Name to SummarizeInvasiveSpecies. Change the Label to Summarize Invasive Species. The label—not the name—will be displayed in the application. Model names can't include special characters such as spaces and underscores, while labels can be formatted more readably. On the ModelBuilder tab, in the Model group, click Save . Saving the model doesn't save the project, nor does saving the project save the model. However, if you attempt to exit ArcGIS Pro with an unsaved model, you'll be prompted to save it. As you have seen, a model can be run from the model view. A model can also be run as a geoprocessing tool. This is a more common and convenient way to run a model. In the Catalog pane, browse to Toolboxes > Make_a_geoprocessing_model.tbx > Summarize Invasive Species. When you saved the model, a model tool was created in your project toolbox. You can create a new model directly from a toolbox by right-clicking the toolbox and clicking New > Model. In the Catalog pane, right-click the Summarize Invasive Species model and click Open. The model opens as a geoprocessing tool. You could run it now from the Geoprocessing pane and it would produce the same output as running it from the model view. However, a geoprocessing tool isn't very useful until it has parameters that can be set by the user. Make the model view active. The model view is now called Summarize Invasive Species. Right-click the Commercial Campgrounds input data variable and click Parameter. The letter P (for parameter) appears next to the input data variable. This means that the variable has been set as a parameter in the model geoprocessing tool. In the Catalog pane, right-click the Summarize Invasive Species model tool and click Open. In the Geoprocessing pane, the tool updates with its new parameter. You need to reopen the tool to refresh its display, even if the tool is already open in the Geoprocessing pane. The tool parameter name, Commercial Campgrounds, comes from the name of the input data variable. You'll change it to something more general. This parameter allows the user to pick any layer that represents a point of contact with invasive grasses. You'll also set a second model parameter that allows you to choose a buffer distance and units. You can leave the Geoprocessing pane open as you edit the model. Make the model view active. Right-click the Commercial Campgrounds input data variable and click Rename. In the edit box, change the name to Human Contact Locations. Press Enter. Right-click the Buffer tool element and click Create Variable > From Parameter > Distance [value or field]. The new element is represented with a different shade of blue to show that it's a value variable, not a data variable. If necessary, drag the selected Distance [value or field] variable to a location that doesn't cover another model element. Right-click the Distance [value or field] variable and click Parameter. Click some empty space in the model view to deselect the variable. Right-click the Distance [value or field] value variable and click Rename. In the edit box, change the name to Buffer Distance. Press Enter. You'll also rename the green output data variable but you won't set it as a model parameter. This output will later be connected as an input to the Summarize Within tool. Once it has served that purpose, it has no further use in the model. Output data that becomes the input to another process is called intermediate data. When you run the model as a geoprocessing tool, intermediate data is automatically deleted unless you set it as a model parameter. Right-click the Commercial_Campgrounds_Buffer output data variable and click Rename. Change the name to Contact Location Buffers and press Enter. In the Catalog pane, in the Make_a_geoprocessing_model toolbox, right-click the Summarize Invasive Species tool and click Open. The tool parameter names match the model variable names. Next, you'll clear the default values from the geoprocessing tool parameters. These values don't represent expected user preferences, so there is no reason to have them appear by default. Make the model view active. Right-click the Human Contact Locations data variable and click Open. Highlight the default value of Commercial Campgrounds and press the Delete key. Click OK. The model process turns gray (not ready to run) because you have just removed the input value to the Buffer tool. That's okay. The model can't be run from the model view in this state, but it can still be run as a geoprocessing tool when you fill in the parameters. Right-click the Buffer Distance value variable and click Open. Highlight the default distance value of 5 and press the Delete key. Click OK.
All the model elements are now gray. In the Catalog pane, right-click the Summarize Invasive Species tool and click Open. Both tool parameters are now blank. They also have red asterisks to indicate that they are required parameters. Notice that deleting the buffer distance value also reset the distance units from kilometers to Unknown. To finish building the model, you'll add an input data variable representing invasive species and you'll add the Summarize Within tool. You'll connect input variables to tools and set model parameters. Previously, you created an input data variable by dragging a layer from the Contents pane to the model view. This time, you'll create a variable from the ribbon. Make the model view active. On the ModelBuilder tab, in the Insert group, click Variable . On the Variable Data Type dialog box, click the drop-down arrow and click Feature Layer. (You may need to scroll up in the list.) Click OK. Drag the selected variable to an empty part of the model. Connector lines are reshaped to avoid contact with model elements. The default placement of the Feature Layer variable may cause some connector lines to reshape in ways that aren't useful when the variable is moved. You can reset a connector line by selecting it and dragging its vertices. You can also modify the default appearance and behavior of connector lines in the Links group of the Diagram contextual tab. Rename the Feature Layer data variable to Invasive Species. Right-click the Invasive Species data variable and click Parameter. When you run the model as a geoprocessing tool, you'll be able to choose which invasive species to analyze. On the ModelBuilder tab, in the Insert group, click Tools . In the Geoprocessing pane, in the search box, type Summarize Within. The tool opens in the list of search results. If you have analysis privileges in an ArcGIS Enterprise portal, your search results will also include a Summarize Within tool from the Standard Feature Analysis toolbox. Use the Summarize Within tool from the Analysis Tools toolbox, as shown in the image above. By default, search results are displayed as tiles with a short description. 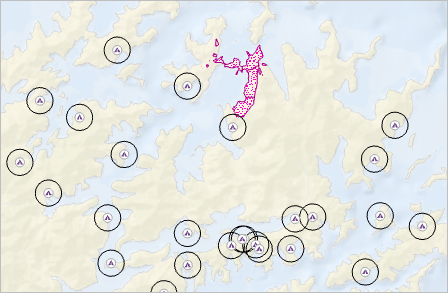 If your results are displayed as a list instead, click the Tiles button at the bottom of the Geoprocessing pane. Drag the Summarize Within tool from the Geoprocessing pane to the model view. 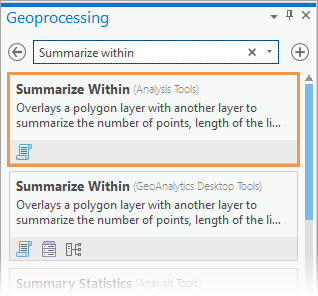 If you accidentally open the Summarize Within tool in the Geoprocessing pane, click Back to return to the list of search results. The Summarize Within tool requires two inputs. One is the layer of features to be summarized, which is Invasive Species. The other is the layer of zones within which invasive species are analyzed, which is Contact Location Buffers. The Output Grouped Table data variable is an optional output of the Summarize Within tool. It isn't used in this analysis. Hover over the Invasive Species data variable. Drag a connector line to the Summarize Within tool. Release the mouse button and click Input Summary Features on the pop-up menu. If you accidentally make the wrong choice on the pop-up menu, click the connector line to select it. Delete the connector line and draw a new one. 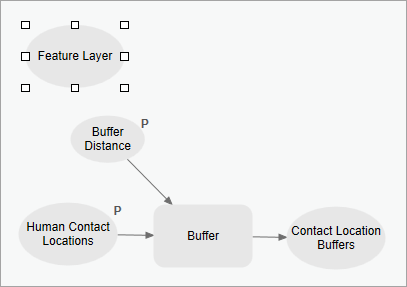 Connect the Contact Location Buffers data variable to the Summarize Within tool as Input Polygons. You'll adjust the model layout in a few moments. Right-click the Output Feature Class data variable and click Parameter. Setting this variable as a model parameter allows you to name the output feature class and change the output location when you run the tool. Right-click the Summarize Within tool and click Create Variable > From Parameter > Shape Unit. Drag the selected variable to an empty part of the model if necessary. Rename the Shape Unit value variable to Area Unit of Measure. This parameter lets you choose the measurement units, such as hectares, in which to summarize the area covered by the invasive species. Right-click the Area Unit of Measure variable and click Parameter. Deselect the Area Unit of Measure variable. On the ModelBuilder tab, in the View group, click Auto Layout . Optionally, select model elements and drag them to better positions. Your model layout may look different, but the tool processing order should have the same left-to-right sequence. The Diagram tab has options to modify the model's orientation, spacing, connectors, text properties, and more. For more information, see Model diagram appearance. In the Catalog pane, open the Summarize Invasive Species tool. The tool looks good, except that Output Feature Class should be the last parameter. You'll change the parameter order in the next section. The model diagram is finished. The model doesn't capture the entire analysis workflow from the Use geoprocessing tools tutorial. The Select Layer by Location tool has been left out to simplify the workflow. Therefore, every input feature from the Contact Location Buffers layer will be summarized in the output dataset, whether or not it contains an invasive species. This means that many output features may have summary values of 0. Before running the model, you'll reorder the parameters on the geoprocessing tool. You'll also set default symbology for the model output. Finally, you'll save the model output to its own geodatabase. On the left side of the Tool Properties dialog box, click the Parameters tab. The top-to-bottom order of parameters in the Tool Properties dialog box matches the order in which parameters appear on the geoprocessing tool. This order reflects the sequence in which you set the variables as model parameters. In the first column of the table (the column with no heading), click the numeral 4 to select the last row, representing the Area Unit of Measure parameter. 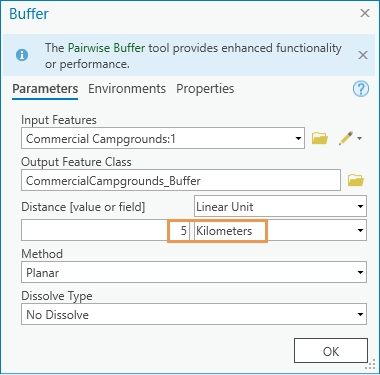 Drag the selected parameter up one position above the Output Feature Class parameter. As you drag the parameter, its position is represented by a horizontal gray line. Scroll across the parameter table to see more columns. The last column allows you to assign symbology to model datasets using a layer file (.lyrx). A layer file stores display properties of a layer, such as symbology and labeling, without storing spatial coordinates or attributes. In this case, you want the output features, which are buffer areas, to be symbolized as outlines with a hollow fill. You'll browse to a layer file included with this project. You can resize the Tool Properties dialog box by dragging its sides or edges. In the last row of the table, representing the Output Feature Class parameter, click in the table cell in the Symbology column and click the Browse button that appears. In the browse window directory, under Project, click Folders if necessary. 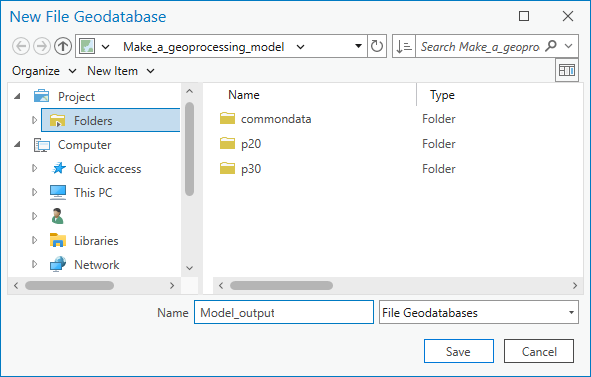 In the browse window, double-click Folders > Make_a_geoprocessing_model_1 > commondata > userdata. 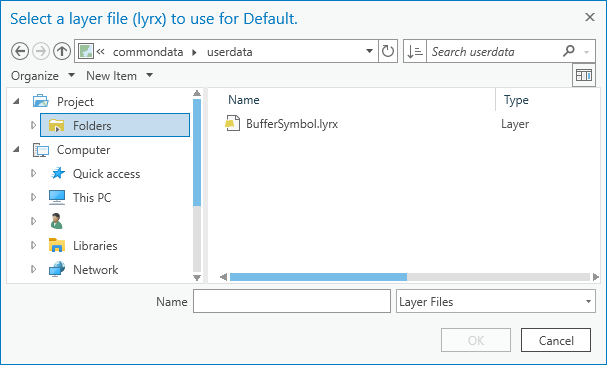 Click BufferSymbol.lyrx to select it and click OK. The path to the layer file appears in the Symbology column of the parameters table. Click OK on the Tool Properties dialog box. Earlier, you saw that model output data is saved by default to your project geodatabase. This geodatabase also contains the model input data, such as feature classes of invasive grasses, campgrounds, roads, and trails. To keep your model output data separate from the input data, you'll create a new geodatabase. In the Catalog pane, right click Databases and click New File Geodatabase . The New File Geodatabase dialog box appears and shows the contents of the project's home folder. You should see three subfolders: commondata, p12, and p20. If necessary, browse to this folder by clicking Folders in the directory, and double-clicking Make_a_geoprocessing_model. In the Name box, type Model_output. The new geodatabase will be stored in the project folder at the same level as the subfolders in the project. In the Catalog pane, expand Databases, if necessary, to see the new geodatabase. Now you need to direct the output data from the model to this geodatabase. On the ModelBuilder tab, in the Model group, click Environments . On the Environments dialog box, under Workspace, there are two settings: Current Workspace and Scratch Workspace. These settings determine default paths for browsing to input data and saving output data. Changing the Scratch Workspace will save the model output to a different geodatabase. Next to the Scratch Workspace setting, click the Browse button . In the Scratch Workspace browse window, in the directory, under Project, click Databases. On the right, click Model_output.gdb to select it. Click OK. The Scratch Workspace setting is updated. If you hover over an environment setting, an information icon appears. Hover over the icon to learn more about the setting. Click OK on the Environments dialog box. The Output Feature Class parameter appears at the bottom of the tool pane. The tool is ready to use. Close the model view. 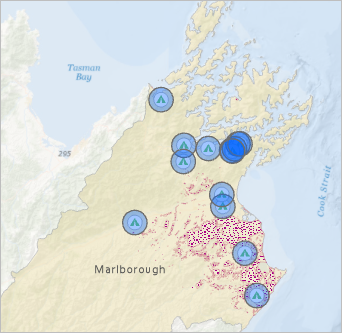 Confirm that the Marlborough map view is active. To reopen the model view, in the Catalog pane, right-click the model tool and click Edit. You'll run the tool and inspect the output. In the Contents pane, turn off the Commercial Campgrounds and Nassella Tussock Range layers. Turn on the Campsites and White Edged Nightshade Range layers. On the map, in the north of the region, it looks as if there are one or two campsites in proximity to White-edged nightshade. 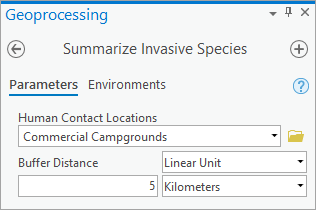 In the Geoprocessing pane, on the Summarize Invasive Species tool, set the Human Contact Locations parameter to Campsites. Set the Buffer Distance to 1.5 Kilometers. Set the Invasive Species to White Edged Nightshade Range. Set the Area Unit of Measure to HECTARES. Delete the default Output Feature Class filename (the part after Model_output.gdb\) without clearing the full path and type Nightshade_Near_Campsites. Notice that the output path goes to the new Model_output geodatabase because of your environment setting. When the tool finishes, you'll see a success message at the bottom of the Geprocessing pane. In the Contents pane, the Nightshade_Near_Campsites layer is symbolized with a black outline and hollow fill, as specified by the BufferSymbol layer file. At the present map scale, the buffer features are obscured by the Campsites symbols. Zoom in on the map to see the buffers. In the Contents pane, right-click the Nightshade_Near_Campsites layer and click Attribute Table . If necessary, scroll across the table. Right-click the Summarized area in HECTARES field heading and click Sort Descending . Only one campsite, Waimaru, has White-edged nightshade within 1.5 kilometers. The summarized area value is 7.35 hectares. In the Catalog pane, browse to Databases > Model_output.gdb and confirm that Nightshade_Near_Campsites has been saved to this geodatabase. On your own, use the Summarize Invasive Species tool to analyze other relationships between human contact locations and invasive species. The tool works on selected input features for the Human Contact Locations layer. For example, you can analyze invasive species near principal highways in the Roads layer. However, the tool ignores selections on the Invasive Species layer. Your last task is to document the geoprocessing tool. The documentation will be similar to help for other geoprocessing tools: it will explain the tool's purpose and usage. 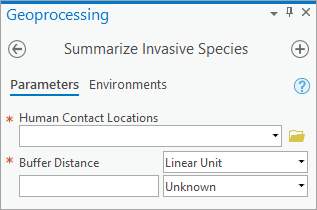 In the Geoprocessing pane, on the Summarize Invasive Species tool, click the Help button to open the tool help. The tool help opens in a browser tab or window. (The URL points to a local file on your computer.) The tool has a title but no other help. To document the tool, you edit its metadata. Close the browser tab or window showing the tool help. In the Catalog pane, right-click the Summarize Invasive Species tool and click Edit Metadata . A metadata view opens. In the Contents pane, the elements of the metadata style are displayed. In the metadata view, in the Tags box, type or copy and paste the following tags: summarize, biosecurity, invasive species, New Zealand. Make sure the tags are separated by commas. The tags are keywords that can help users find the tool if you share it as a geoprocessing package or as part of a project package. In the Summary (Abstract) box, add the following text: This tool is designed for analysis of plant biosecurity issues in New Zealand. It summarizes the range of invasive grass species near locations where people may come into contact with the grasses and facilitate their spread. Under Syntax, expand Human_Contact_Locations. In the Dialog Explanation box, add the following text: The features representing locations where people may encounter invasive grass species. Under Syntax, expand Buffer_Distance. In the Dialog Explanation box, add the following text: The distance zones around human contact locations that will be analyzed for the presence of invasive species. Under Syntax, expand Invasive_Species. In the Dialog Explanation box, add the following text: The invasive grass species to be analyzed for proximity to human contact locations. Under Syntax, expand Area_Unit_of_Measure. 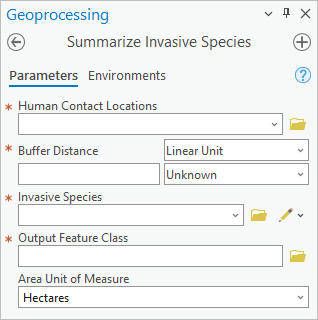 In the Dialog Explanation box, add the following text: The units in which the area range of invasive species within each buffer zone is expressed. Under Syntax, expand Output_Feature_Class. In the Dialog Explanation box, add the following text: The name of the output feature class. In the Geoprocessing pane, hover over the Help button to see the tool summary. Hover over the information icon that appears next to tool parameters to see your explanations. Close the Summarize Invasive Species metadata view. 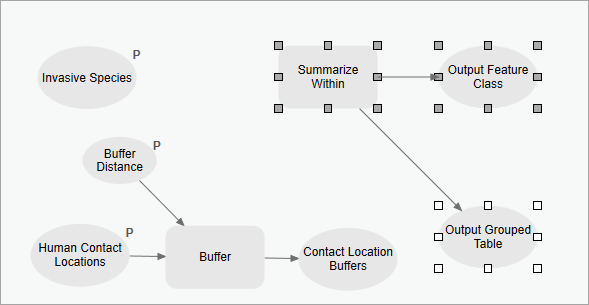 This geoprocessing model automates an analysis workflow. It can be used to analyze any combination of human contact locations, invasive species, and distance relationships. If you share your model with other users, they can run the geoprocessing tool without opening the model view. A model can be shared in different ways. If you share it as a project package (.ppkx file), the package will include the model, the map view, and all the project data. If you share it as a geoprocessing package (.gptx file), the package will include only the geoprocessing tool and sample input and output data layers. If you plan to share your model, you may want to substitute inline variables for hard-coded paths to input and output datasets.